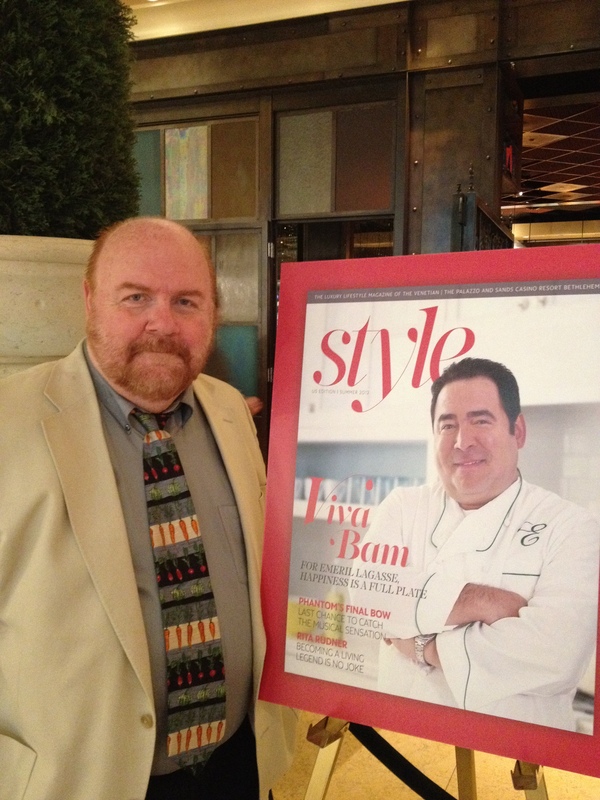 Last summer, I was contacted by the American editor of Style magazine (then Sands Style) to see if I would like to interview Chef Emeril Lagasse for the relaunch of the magazine. Like every cooking fan in America, I’d seen Emeril a gazillion times; unlike many cooking fans, I’ve eaten at one of his restaurants in New Orleans. Naturally, I agreed. Despite his fireplug stature, Lagasse looms larger than life in virtually ever aspect of his being. He is immediately gregarious and extraordinarily self-effacing. He’s passionate about food. He loves to teach and to share what he’s learned. And he is remarkably generous in spirit. Here’s a story that didn’t make it into the piece I had published: Part of the craft of managing a celebrity interview is figuring out what to ask him or her first. Way back when I was in college, my brilliant journalism spirit guide, Joseph N. Bell — a lecturer, because he was a working stiff, not an ivy-clad professor — told his class that something like 75-80% of one’s energy prepping for an interview should be devoted to formulating the first question. Famous (and even semi-famous) people are subjected to an endless parade of clueless journos who haven’t read their book or seen their movie or listened to their record, who inevitably kick off the interview with some slow-pitch softball such as “So… what inspired you to _____?” B-o-r-i-n-g. Shockingly, the rest of that sort of interview winds up with a lifeless string of canned answers to the canned questions. The cover, larger than life. The pic of Emeril, not so much. Our phoner kicked off with the typical pleasantries; underneath it all, I’m sure he was probing to see if I was actually interested in and/or knowledgeable of what he was doing, and I was curious to ascertain whether he was full of camaraderie when the red light was on, only to turn cold as a fish case haddock in its absence. As luck would have it, the two of us fell into sync more or less immediately. Even without asking, when I relayed the story of The Bride and The Grits, he responded with, “I’ll be happy to send you the recipe.” Within an hour of our interview’s conclusion, he (or one of his minions, at his direction) had. Like most celebrated chefs, Lagasse had served his Malcolm Gladwell 10,000 hour apprenticeship many times over. And, like virtually all of the chefs I’ve had the pleasure of interviewing, he was generous to a fault regarding his team. 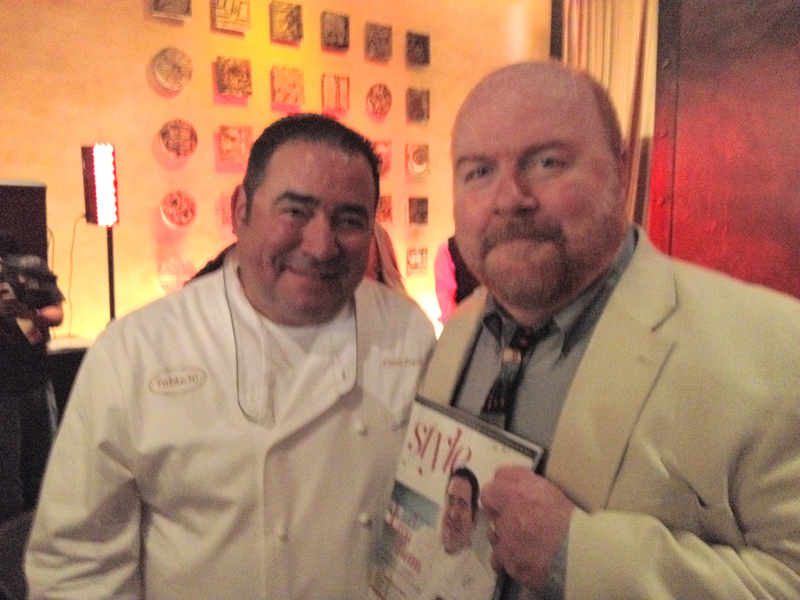 Many of Emeril’s krewe have been soldiering on with him in excess of a decade (some even two! ), a surprising display of loyalty considering the fluidity of movement in the world of haute cuisine. Clearly, the man is doing something right. Every now and then, we all aspire to kick it up a notch. 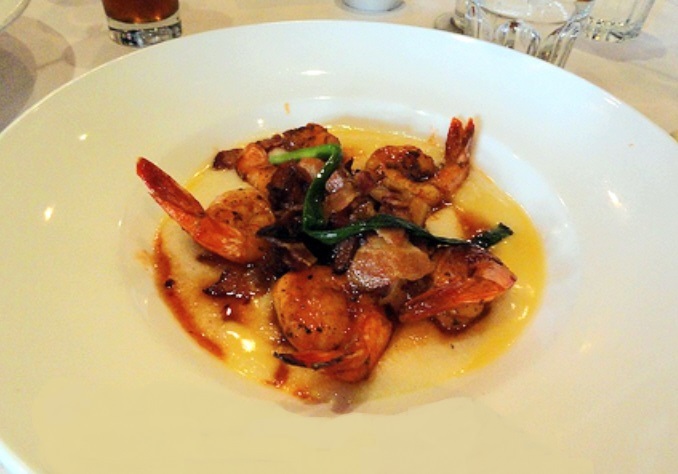 Recipe from NOLA Restaurant by Emeril Lagasse. In a large bowl, combine the shrimp with the Essence and salt and toss to blend. Set aside as you prepare the skillet. Place a large, 14-inch skillet over high heat and add the olive oil and heat until very hot. Add 1 tablespoon of the butter to the pan. Swirl to melt, then add the shrimp to the pan, being sure that the shrimp are in one layer in the pan. Sear the shrimp until well caramelized on the first side, about 1 minute. Turn the shrimp over and add the smoked mushrooms, bacon and Abita BBQ Glaze to the pan. Continue to cook, stirring occasionally, until the shrimp are well coated with the sauce and just cooked through, about 3 minutes. Add the remaining butter to the pan and swirl until melted into the sauce. To serve, divide the grits between 8 entrée-sized shallow bowls. Drizzle about 2 tablespoons of the Citrus Beurre Blanc around the edge of the grits near the rim of the bowl. 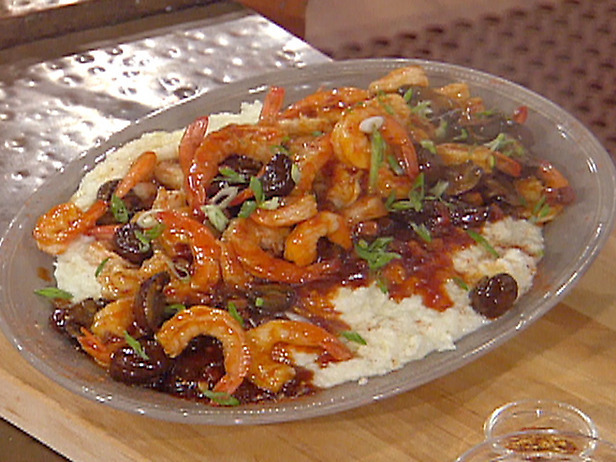 Divide the shrimp, mushrooms, bacon and sauce evenly between the bowls, and place a grilled green onion on top of the grits in a circle. Serve immediately. Place all the ingredients except the heavy cream and butter in a 1-quart saucepan and place over high heat. Bring to a boil and reduce until the liquid is nearly evaporated, 12 to 14 minutes. Add the heavy cream to the pan and reduce by half, 1 to 2 minutes. Remove the pan from the heat and reduce the temperature to medium low. Add a few cubes of the butter to the pan and use a whisk to stir constantly until the butter is melted. Return to the heat and add a few more pieces. Continue to place the pan on and off the heat, adding a few cubes of butter to the pan and whisking until all the butter is used. Remove the sauce from the heat and strain through a fine-mesh strainer. Keep warm until ready to serve – do not allow the sauce to boil or it will separate. Combine the ketchup, beer, brown sugar and crushed red pepper in a saucepan and bring to a boil. Reduce heat slightly and continue to cook at a steady simmer until the sauce is translucent and reduces to a consistency thick enough to coat the back of a spoon, 5 to 10 minutes. Set aside. You should have about 1 1/4 cups of glaze. In a medium bowl, combine the mushrooms, Essence and olive oil. Toss to combine and place on the rack of a stovetop smoker. Prepare the smoker over medium-high heat using applewood smoking dust, or the smoke chips of your choice. When the smoker begins to smoke, close the lid. Smoke the mushrooms until cooked through, about 20 to 25 minutes. Remove from the smoker and set aside until ready to use. While the mushrooms smoke, place the bacon in a 10-inch sauté pan over medium-low heat and render the fat from them until they are just beginning to get crispy, 10 to 12 minutes. Remove the bacon from the pan using a slotted spoon and transfer to paper towels to drain. Set aside until ready to use. Place a grill pan over medium-high heat. Drizzle the green onions with the olive oil and season with the salt and pepper. Place the green onions on the grill and cook for 2-3 minutes, turning occasionally to ensure even browning. Remove the green onions from the heat and set aside as you prepare the rest of the dish.